Our NEW mini-tags are perfect for small items such as shoes, jewelry and accessories. They are only 1" x 1" and can be folded in half so that the bar code is on one side and the price and date are on the other side.There are almost 3,000 tags per roll! Sorry, mini-tags can only be used in Liberty 2002 and above. Using these tags requires either an Eltron 2622, Eltron 2722, Eltron Orion, Eltron/Zebra 2844, Eltron/Zebra 2824, Eltron/Zebra 2443 or TSC Thermal printer. These tags are only available in white and they are 'sticky'! 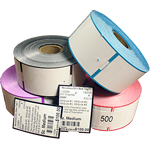 Minimum order is 12,000 tags or 4 rolls. The price below is per box (4 rolls per box). Select the higher quantity level for better discounts and shipping costs.